The next wave of technology adoption in U.S. schools is likely to be virtual reality “class kits,” said Ben Davis, a senior market analyst for education at Futuresource Consulting, a research firm that held an event here Thursday evening. More than 15 percent of U.S. schools are forecast to have a VR class kit by 2021, and globally more than 70 million K-12 students are expected to have a VR experience in school in that year, Davis said. China’s K-12 market is also expected to see significant VR adoption in the mid- to long-term, he said. As schools move to replace older Chromebooks with new ones or other devices, “you’re going to see an increasing adoption of this immersive technology alongside that,” he said at a session held during Bett, the world’s largest educational technology show. 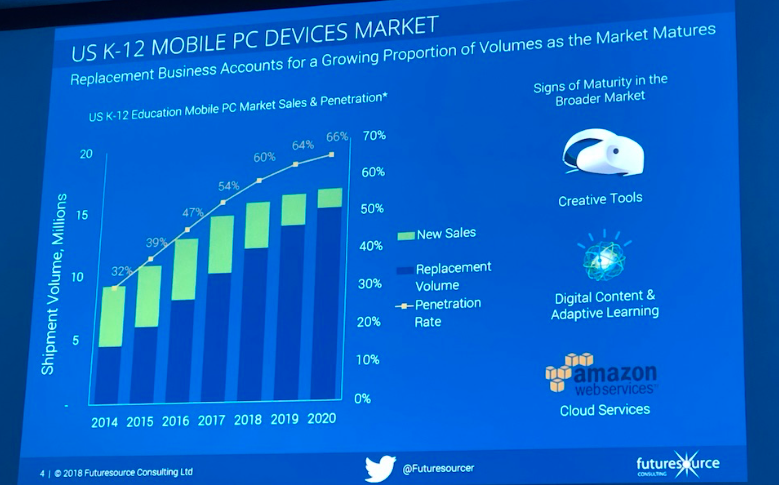 Futuresource expects that the market penetration of computing devices in U.S. schools will hit 66 percent by 2020, and about 50 percent of computers that are shipped that year will be to replace ones that exist in schools. A walk around the Bett floor, in fact, is a “reality” immersion into virtual reality’s attempts to sell to the schools market, with 18 companies representing the VR experience in one way or another, and nine companies that are using “immersive” as part of their description and pitch to the education community. With all of this equipment launching into the market, the next natural question is: What will go on it? “We do think [VR] creates opportunities for publishers to differentiate content through VR,” said Davis, as Pearson is doing in higher education. Simulations are one way to use the technology, giving students a “virtual lab” experience, for instance. Language learning is a major focus now in the consumer market, and providers are creating content particularly for Latin America, Davis said. Other options for VR content include creating simulated worlds, as is done in gaming, and providing virtual tours. Is the Next Big VR Move in China? “Google has expeditions with its Cardboard platform,” said Davis, and is selling class kits through its education channel. The original equipment manufacturers for Microsoft personal computers are launching low-cost mixed-reality headsets as well. And NetDragon, based in China, has increased its education portfolio with the acquisition of JumpStart and Promethean. “They have a lot of investment in VR across both gaming and education platforms,” he said, with the Chinese government encouraging the investment in both sectors. “Does the next big move in VR come out of China in the next few years?” he asked.